My father hollowed out a coconut and twisted some wire around it to make this bird feeder. 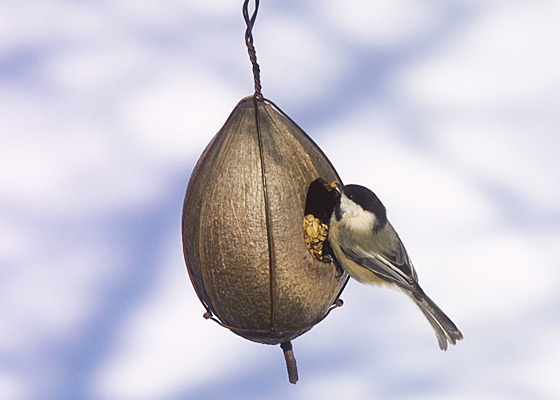 Black-capped chickadees and other small birds love to visit it for sunflower seeds as it swings in the breeze. This feeder is my favorite also because reminds me of the person who made it. 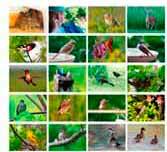 If your interest in birds is serious, you might want to get a better binocular. Like a Vortex Diamondback. It has good optical quality and an extremely wide field of view. It's waterproof and has a lifetime guarantee. It comes in several sizes. We recommend the 8x42 model.